All Things Brantley, All Things Tribe: Sneak Peek of the August 8 Michael Brantley Bobblehead Giveaway! 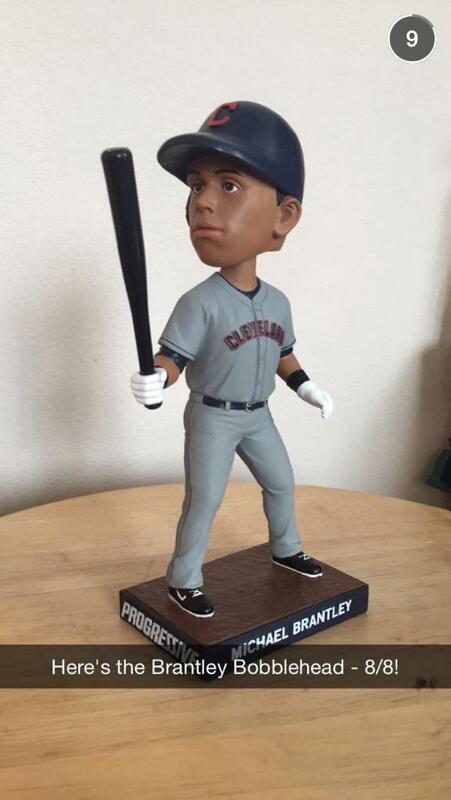 Sneak Peek of the August 8 Michael Brantley Bobblehead Giveaway! i don't have snapchat and have no desire to create one, but luckily someone posted the pic of the bobble on twitter. so thank you very much @lucy_hensley07. now i can write a first-thoughts critique about it. the overall look of the bobblehead is nice. i like that it's of Michael at the plate. he had such a tremendous season offensively last year, i think it was only right for the Indians to create some kind of offensive bobble. so that gets a big thumbs up from me. as for the jersey choice, the away gray makes sense because his other 2 bobbles had him in the home white and home cream jerseys. so this bobble was either going to be gray or blue, and i definitely like the gray better. you all know me by now: any time the Indians are giving something away that's Michael Brantley related, i am going to go to Cleveland to get it. once i have this bobblehead in my possession, i can do a more thorough review of it. stay tuned. and congrats to Michael on now having had 4 things on the Indians promotional schedule! this marks his 3rd bobblehead giveaway, 2nd given away at Progressive Field, in 2 years. the Tribe also gave out a Michael Brantley replica jersey on July 27, 2013. i absolutely love that my boy continues to be recognized by the team in these special ways, and i hope there are many more "treats" featuring Michael at future games!